Fine 8" X 10" black and white photo of Bednarik in a three point stance. It is inscribed by Mr. Bednarik HOF, '67. . Handsome black and white photo of Ms. Tyler leaning on a fence. Teamed with a Signed Bookplate (in a panel underneath the photo). Matted and housed in a matching frame that measures 9" X 11".. . Signed by Author. Handsome full-face and shoulder black and white photo of a youthful Mr. Vidal. Teamed with a Signed Bookplate (in a panel underneath the photo). Matted and housed in a matching frame that measures 10" X 12".. Signed by Author. Handsome black and white portrait of the author. Teamed with a Signed First Day Cover (to the bottom of the photo). Double Matted in dark green and gray in a matching frame that measures 12" X 15". Very Attractive Photo. . Signed by Author. Handsome black and white full face portrait of Mr. Heller. This is a publisher's blurb photo signed by the author on the bottom (white portion) of the photo. In a matching frame that measures 6.5" X 8.5". . Signed by Author. Handsome black and white photo of Mr. Warren. Teamed with a Signed Bookplate (in a panel underneath the photo). Matted and housed in a matching frame that measures 8" X 11".. Signed by Author. Fine 8" X 10" black and white head and shoulder shot of the noted jazz saxophonist. Inscribed and Signed in black ink all along the top and bottom (white portions) of the photo. Nice contrast.. Signed. Photo . Handsome black and white portrait of Mr. Ferlinghetti. This is a publisher's blurb photo signed by the author on the bottom (white portion) of the photo. In a matching frame that measures 6.5" X 8.5". . Signed by Author. Handsome black and white photo of Mr. Grass with pipe in mouth. Teamed with a Signed Bookplate (in a panel underneath the photo). Matted and housed in a matching frame that measures 11" X 14". . Signed by Author. Handsome black and white photo of Mr. Eberhart. Teamed with a Signed Bookplate (in a panel underneath the photo). Matted and housed in a matching frame that measures 8" X 11".. Signed by Author. Handsome sepia tone (old) photo of Mr. Moore (photo is by Alvin Langdon Coburn). Teamed with a Signed Bookplate (in a panel underneath the photo). Matted and housed in a matching frame that measures 10" X 12".. Signed by Author. Handsome photo of O'Hara at a typewriter with a crowded desk/bookcase in the background and with the ever-present cigarette in hand. Double Matted in Black and gold with clear signature in panel beneath photo. Framed in gilt frame that measures 12 1/2" X 14". Scan available upon request to prospective buyers. Very Attractive Photo. . Signed by Author. Handsome photo of Puzo sitting on a sofa, lookng somewhat like a "Don". 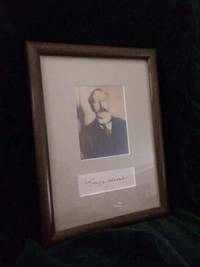 Double Matted in Black and cranberry with clear signature in panel beneath photo. Framed in gilt frame that measures 12 1/2" X 14". Scan available upon request to prospective buyers. Very Attractive Photo. . Signed by Author. Near Fine 5" X 7" color head and shoulder shot of the noted opera tenor. Signed in black ink from his right shoulder down to his belt buckle. Nice photo and signature. Scan available upon request. . 5" X 7" . Handsome color photo of Malamud in front of a doorway with plant to the author's right. Teamed with a Signed First Day Cover (to the right of the photo). Double Matted in maroon and gold. Framed in a maroon frame that measures 11" X 17". Scan available upon request to prospective buyers. Very Attractive Photo. . Signed by Author. Fine 8" X 10" black and white head and shoulder shot of the 1950's cowboy star. Inscribed and Signed in black ink in a white area across the author's chest. Nice contrast..
Fine 8" X 10" black and white head and shoulder shot of the noted playwright. Inscribed and Signed in black ink in a white area at the left side of the photo. Nice contrast..
Fine 4" X 6" black and white photo postcard of Larry in front of the City Lights Bookstore in S.F. Boldly signed in black ink in a light area at the bottom right of the photo. Great photo and decent contrast on the signature.. 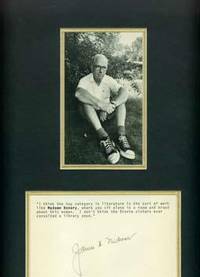 Handsome photo of sneaker-clad author sitting in front of a bush with a signed quote from the author in a panel beneath photo. Framed in gilt frame and double matted in gold and black. The frame measures 11" X 15". . 11" X 15". Fine 5" X 7" black and white head and shoulder shot of the author. Signed in black ink in a light area at the bottom right of the photo. Nice photo and decent contrast on the signature..